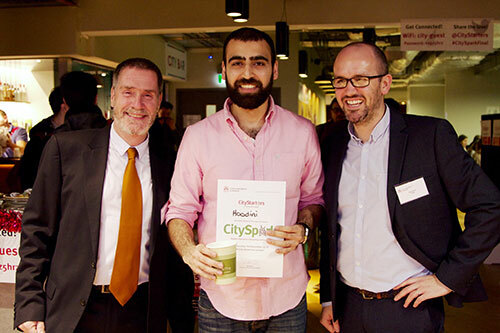 Fifteen teams of budding student entrepreneurs have taken part in CitySpark, the University’s business idea competition. As part of the event, teams set up stalls where they pitched their business ideas to academics and representatives from the local start-up community. More than 150 guests gathered in CityBar to see the finalists and celebrate the creativity and innovation of the students taking part. Organised as part of the CityStarters programme, the event aims to give students the chance to network and gain feedback on their business ideas, while competing for funding to progress their idea. From more than 50 entries, 15 of the best were selected by a panel of esteemed judges to participate in the finals. During the marketplace, around 40 judges, comprised of successful entrepreneurs, business owners and academics, voted for their favourite ideas after working their way round the various stalls. 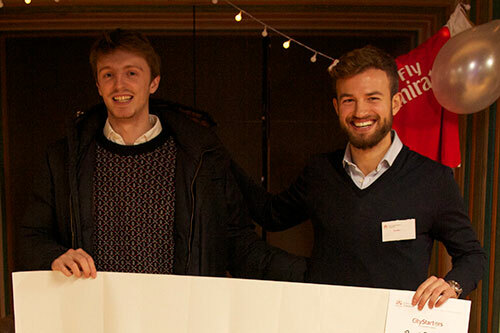 Students Stefan Metaxas and Henry Joliffe were crowned the winners with their BookBall business idea, an on demand sports facilities booking service. They were awarded the top prize of £1,000. Stefan said they came up with the idea after becoming frustrated with trying to book a football pitch in London. Stefan wanted to make this process simpler, so enlisted the help of Henry and got started on the idea of BookBall. The most valuable thing about CitySpark, Stefan says, was getting feedback from the guests. The best part was hearing how excited other people were about the idea - they share the same pain as we do. Henry and I can’t wait to try and help them out with BookBall. Henry and Stefan are now working on a prototype of BookBall, refining their business model and preparing for the next stage of CitySpark. Prizes were also awarded to two second place runners up, and three third place runners up. For the first time, a Green Award was also given for the most sustainable business idea. This went to Hoodini, set up by Umar Qamar to use leftover fabric to make hoodies. The awards were handed out by Matt Barrie, CEO and Founder of Freelancer.com, the world’s leading freelancing and crowdsourcing marketplace with more than 17 million users. Matt is an award winning entrepreneur, technologist and lecturer, having won numerous awards, including being named the inaugural BRW Entrepreneur of the Year in 2011, and one of the 11 most influential Australians in IT by SmartCompany. Alex Elkins, Entrepreneurship Education Manager said: “The marketplace has been a true success, demonstrating the entrepreneurial talent we have at City. We welcomed over 150 people including staff, students and industry specialists to join us in celebrating and voting for the best new ventures. Bookball: an on demand booking service for sports facilities idea created by Cass students Stefan Metaxas and Henry Joliffe. Hoodini: an idea proposed by Umar Qamar to use leftover fabric to make hoodies. Binta’s Kitchen: School of Health’s Farhana Ibrahim produces a delicious sauce with rich Nigerian flavours. 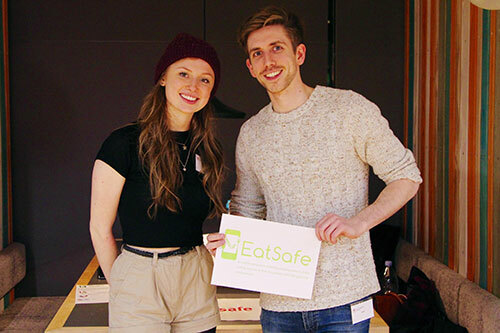 EatSafe: Matt Bland from Cass proposes an app and website that filters allergen data and provides allergy restricted menus for customers. The event was sponsored by the Cass Future Fund and the Sustainability team. CityStarters is the home hub for students at City University London looking to kick-start their entrepreneurial talent.